The World Cup is going to be fantastic. You forget how many superstars there are in soccer, at least sometimes I forget. There’s no better stage for Messi, Ronaldo, Rooney, Donovan and everyone else to fight it out than the World Cup. The last one feels like a very, very long time ago so I’m ready for some international soccer competition. If you’re not ready, then watch this Nike soccer ad and I guarantee it will get you excited. Two new songs off Ed Sheeran’s new album have been in my music rotation recently after his performed both of them on SNL. I have never really been into Ed Sheeran in the past. His songs have always been popular and I have been kind of ambivalent towards them in the past. They’re good and I understand why they are popular but nothing that got me too excited. He started growing on me more after seeing him cover my favorite Beatles song “In My Life” on the Grammy Tribute Show to the Fab Four. He performed a fantastic acoustic arrangement that I’ve listened to many times since. Last week on SNL, I heard these two songs for the first time and instantly wanted to more. “Sing” is produced by Pharrell who seems to have a hand in every hit song these days, while “Don’t” is supposedly about a fling with Ellie Goulding that ended badly. They’re both funkier and have a different vibe than anything he has put out before. Based on these two tracks, I’m excited to check out the album and I hope Sheeran continues with this acoustic, bass-y, funk vibe. I’ve been waiting for this reunion for a while now and it was pretty awesome. Unfortunately, I couldn’t be there in person but I watched the whole video and enjoyed all 90 minutes. It was exactly the set I was hoping for – lots of great album cuts along with the classics. Andre 3000 singing Behold A Lady, which is one of my favorite songs off of the Love Below, was unexpected and fantastic. Elevators, Shutterbug, GhettoMusick and opening with B.O.B… I loved it all. Like I said back in January, the breadth of their catalog is impressive and they put on a great show. There were only two problems with this weekend’s performance. First, despite it being the first time Andre and Big Boi have performed together in years, the crowd was dead. Second, they cut their mics so we didn’t get to hear The Whole World. It’s a festival crowd which means that not everyone was there to see Outkast. So the album cuts were played to a pretty dead crowd, which seemed to bother Andre. 3000 repeatedly tried to hype the crowd and at one point even said that he feels like he’s alone out there. Then, during his biggest hit Hey Ya, he basically performed with his back to the audience. It’s unfortunate that the crowd wasn’t as into the performance as I (or Outkast) thought they would be, but their set was still awesome. Crowd reaction during Behold A Lady may have been nonexistent, but I was really enjoying it and I know there are millions of other Outkast fans who couldn’t be there that appreciated the setlist. I really love Outkast and I’m thrilled that they are touring again. Wait until they play in Atlanta too… I expect the crowd to be drastically different. I don’t think Andre will have to do any crowd hyping in the A. That crowd will be plenty hyped. What a win for the Mets yesterday! 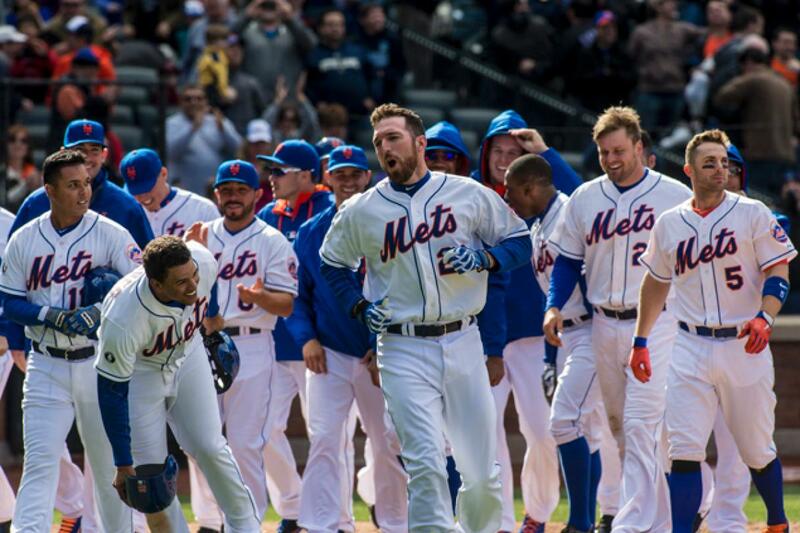 Recently relegated to the bench, Ike Davis came up huge to hit just the 2nd pinch-hit walk-off grand slam in franchise history. All we needed was a fly ball, but the fact that Ike hit it out is perfect. Recent reports suggest that the team is actively seeking a trade partner for Ike and it’s unlikely that one swing will change his fate. But it’s great to see him have a moment and maybe it helps take the pressure off a little bit. Nobody wants to succeed more than Ike and it’s awesome to see him deliver when called upon. Looking at the bigger picture, it’s the 2nd win in a row for a team that set an internal goal of 90 wins. Of course, it’s so early in the season but this was a huge, character building win for a team still finding it’s identity. 2-3 just feels so much better than 1-4. Also, Dillon Gee pitched another good game. If he can become somewhat of an ace and the bullpen shores itself up, maybe 90 wins isn’t so farfetched. I’m getting ahead of myself again, we should just start with a win on Sunday to get to .500 and complete the sweep of the Reds.